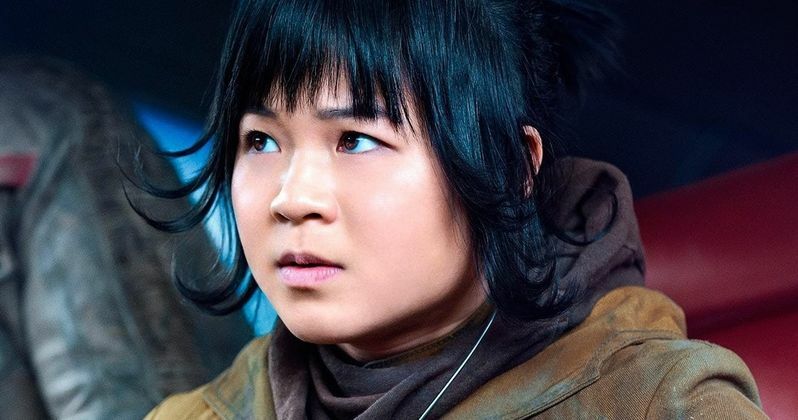 Since the release of Star Wars: The Last Jedi late last year, actress Kelly Marie Tran, who played the new character Rose in the Star Wars sequel, has received excessive amounts of hatred and harassment on her social media accounts from people who did not like her role in the movie. Finally having enough of the cruel backlash, the actress has deleted everything on her Instagram account. While The Last Jedi certainly did have a few problems, many Star Wars "fans" on the Internet have responded with hatred toward the sequel for the past six months, directing their negativity both toward the movie itself and toward those involved. Among those who received hatred online was Kelly Marie Tran, who arguably received even more hateful comments than director Rian Johnson himself. For whatever reason, a number of people did not like the inclusion of Rose in The Last Jedi and have held Tran personally responsible. Some fans hated Rose because they said her character felt "useless," despite her being a great means of showing the bigger picture in the galaxy far far away, going as far as to inspire hope in many characters across the universe. Going further, some less forgiving fans hate Rose for being a non-white, non-male character, which many people seriously have an issue with for all the wrong reasons. Whatever the reason for not liking the character, though, the fact that many of these people have taken their anger out on Kelly Marie Tran by persistently harassing her on her personal social media account is truly callous. Following the release of Star Wars: The Last Jedi, Tran tried to use her newfound fame to inspire and encourage others to follow her dreams just like her. All of her posts showed absolute humility, with her clearly not letting the fame go to her head. Despite this, her comments were regularly filled with hateful slurs and heartless harassment, angry with her both for her race and for how her character was written. While it's truly disheartening that Tran has had to erase everything on her Instagram account to escape from the cruelty, it is at least nice to see that Tran has taken some actions to make things in her life more positive. While Tran hasn't necessarily deleted her entire account yet, she has wiped it clean of every post she has ever made. Hopefully this is an attempt by the actress to keep her 192k followers around so that she can keep a number of her actual fans should she decide to start her account back up again. This decision by https://www.instagram.com/kellymarietran/?hl=en|Kelly Marie Tran to completely wipe her Instagram was most likely for the best. Many of the comments were absolutely cruel, and it's understandable that their relentless hatred would have had an effect on her. It is nice to see that Tran is stepping away from social media for a while in order to most likely surround herself with positivity rather than the negativity that has consumed much of the Star Wars fanbase.